The Federal College Work Study Program (FCWSP) provides part-time jobs to students who have financial need. The work schedule is built around the class schedule. 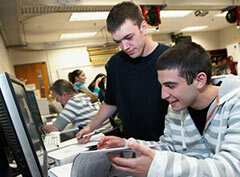 Where possible, Atlantic Cape places students in jobs that relate to their major course of study, interest and skills. As a recipient of a Federal Work Study Award, you are being given a unique opportunity to gain practical work experience along with your college education. This award allows you to work either on-campus or in designated off-campus sites. This work experience can be helpful in your search for a job after graduation. The hourly wage is based on New Jersey minimum wage. Contact the Career & Academic Planning Center for more information at (609) 625-1111 extension 5274. The work study program is based on federal appropriations. Student may be required to stop working at anytime if federal allocations are reached. After completing the FAFSA, the Financial Aid Office can determine if you are eligible to participate in the program. If interested, see the Financial Aid Office If eligible you will be sent to our Career and Academic Planning Office for job placement. You will be required to complete the necessary paperwork in order to process your time sheets, that you will receive bi-weekly. You may work up to 18 hours per week and 26 hours (with Fin. Aid approval) during holiday or spring breaks. You may not work during your final exams without permission from your supervisor. It is important to note that this is a job position that students are required to be responsible and professional at all time.